Before I start you can view the accompanying photo album here. The land of the thunder dragon they call it. 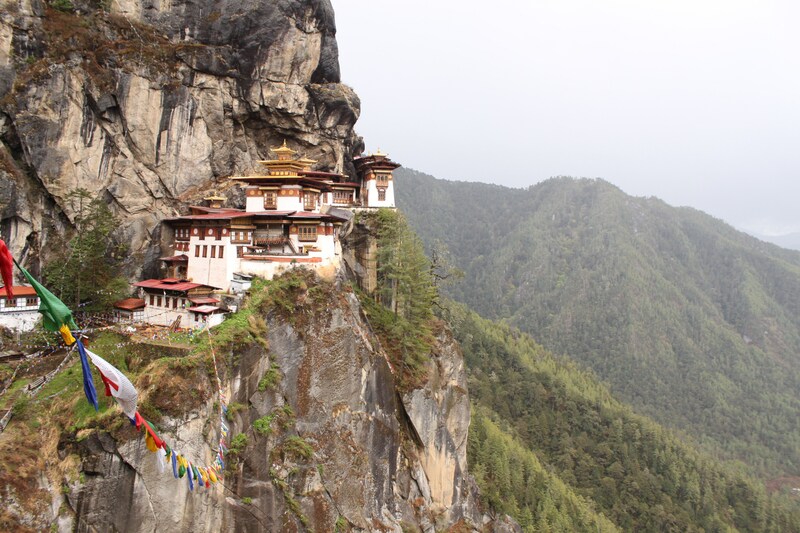 Bhutan is a tiny land locked country tucked away safely in the lap of the Himalayas. Bhutan existed as a patchwork of minor warring fiefdoms until the early 17th century, when the area was unified by the Shabdrung Ngawang Namgyal, who was guided by a prophecy and had fled religious persecution in Tibet and cultivated a separate Bhutanese identity. In the early 20th century, Bhutan came into contact with the British Empire, after which Bhutan continued strong a bilateral relation with India upon its independence. Bhutan’s landscape ranges from subtropical plains in the south to the Sub-alpine Himalayan heights in the north, with some peaks exceeding 7,000 metres (23,000 ft). The state religion is Vajrayana Buddhism, and the population of 691,141 is predominantly Buddhist, with Hinduism as the second-largest religion (restricted to the areas bordering India and Nepal). The capital and largest city is Thimphu. After centuries of absolute monarchy, Bhutan held its first democratic elections in March 2008, though the King holds most of the power and continues to enjoy the support of his people. To defend the country against intermittent Tibetan forays, Namgyal built a network of impregnable dzongs (fortresses), and promulgated the Tsa Yig, a code of law that helped to bring local lords under centralized control. Many such dzongs still exist (each Dzong today is the headquarter of a Dzongkhag, which roughly equates to a district and there are 20 such Dzongkhags in Bhutan) and are active centers of religion and district administration. Portuguese Jesuit Estêvão Cacella and another priest were the first recorded Europeans to visit Bhutan on their way to Tibet. They met with Ngawang Namgyal, presented him with firearms, gunpowder and a telescope, and offered him their services in the war against Tibet, but the Shabdrung declined the offer. After a stay of nearly eight months Cacella wrote a long letter from the Chagri Monastery reporting on his travels. This is a rare report of the Shabdrung. After Namgyal’s death in 1651, Bhutan fell into civil war. Taking advantage of the chaos, the Tibetans attacked Bhutan in 1710, and again in 1730 with the help of the Mongols. Both assaults were successfully thwarted, and an armistice was signed in 1759. During the 1870s, power struggles between the rival valleys of Paro and Trongsa led to civil war in Bhutan, eventually leading to the ascendancy of Ugyen Wangchuck, the ponlop (governor) of Trongsa. From his power base in central Bhutan, Ugyen Wangchuck defeated his political enemies and united the country following several civil wars and rebellions in the period 1882–1885. In 1907, an epochal year for the country, Ugyen Wangchuck was unanimously chosen as the hereditary king of the country by an assembly of leading Buddhist monks, government officials, and heads of important families. The British government promptly recognized the new monarchy, and in 1910 Bhutan signed a treaty which “let” Britain “guide” Bhutan’s foreign affairs. In reality, this did not mean much given Bhutan’s historical reticence. It also did not seem to apply to Bhutan’s traditional relations with Tibet. After India gained independence from Britain on 15 August 1947, Bhutan became one of the first countries to recognize India’s independence. A treaty similar to that of 1910 in which Britain gained power with respect to Bhutan’s foreign relations was signed 8 August 1949 with the newly independent India. In 1953, King Jigme Dorji Wangchuck established the country’s legislature – a 130-member National Assembly – to promote a more democratic form of governance. In 1965, he set up a Royal Advisory Council, and in 1968 he formed a Cabinet. In 1971, Bhutan was admitted to the United Nations, having held observer status for three years. In July 1972, Jigme Singye Wangchuck ascended to the throne at the age of 16 after the death of his father, Dorji Wangchuck. In the late 1980s and early 1990s, the country expelled or forced to leave nearly one fifth of its population in the name of preserving its Tibetan Mahayana Buddhist culture and identity. In one of the world’s least known episodes of what many scholars believe was an “ethnic cleansing,” the Nepali-origin, mainly Hindu Bhutanese fled their homeland. According to the UNHCR, there are more than 107,000 Bhutanese refugees living in seven camps in eastern Nepal. In late 2003, the Bhutanese army with tactical assistance from the India army successfully launched a large-scale operation to flush out Assam liberationist insurgents who were operating training camps in southern Bhutan. Now to my trip! In April 2011, I left my present job and decided to join a new company a month later. I had a month in between, out of which two weeks I needed for some personal work. I still had two weeks, and it would have been criminal to not utilize them for some travel. I chalked out a plan to tour Sikkim and Bhutan. After some discussions with my friend in Darjeeling named Gautam, we decided that I will not be able to do justice to both the regions in two weeks so I dropped Sikkim out of the plan and chalked up a pure Bhutan itinerary. In the meanwhile, my friend Keyur confirmed (despite being against several odds) that he will join me. Keyur is a outdoor enthusiast as well, and the fact that he managed to make it for the trip (and ride the bike safely for over a 1000 km) deserves applauds. Though an experienced trekker, Keyur hadn’t rode the bike much, and so was completely relying on me on that front. Gautam owns a adventure tourism and bike rental agency in Darjeeling and we were to hire bikes from him. I left for Delhi on the 30th of April, which was a Saturday, and Keyur met me at the airport around 6 hours after I reached there. We slept on the swank new Terminal 3’s floor till about 4 am, and then proceeded to board our flight to Bagdogra, which was scheduled for 5 30 am. The flight to Bagdogra was long because it was via Guwahati and we reached Bagdogra at around 10 am. I managed to fix up a cab with a vacationing family for Darjeeling, to share costs. The distance between the two towns is approximately 80 km. The initial stretch of road was nice, with a typical feel of northern Bengal on either side, but not for long. The road deteriorated and went from bad to worse. The scenery was quite good though, and the weather was getting better. In a while, we were driving alongside the famous Darjeeling railway track (narrow gauge) which crosses the road several times during its six hour journey from New Jalpaiguri to Darjeeling. Around half way through, the demographics of people change drastically and if you are familiar with races, you immediately recognize that the people are not Bengalis any more but are Gurkhas from the Indo-Nepal belt. I will come to the political implications of this later. We crossed a major town called Kurseong, and passed just by the railway station, which looked straight out of a 70’s Hindi movie. 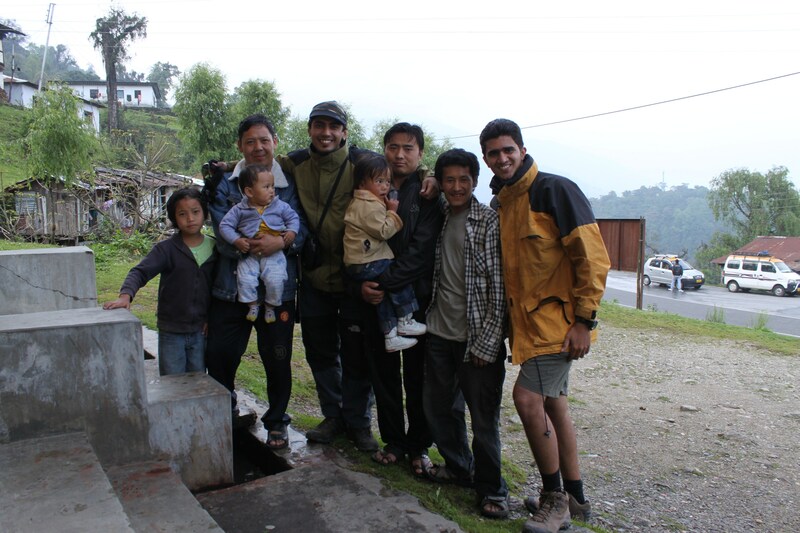 The family who was travelling with us got of at a resort 7 km before Darjeeling. We continued in the car and reached the hill station at around 1 pm. It was crowded and unorganized, typical of any Indian hill station. We tried to figure out the address of my friend’s shop but were misguided and ended up at the other end of the town. Finally we managed to figure out the place and dumped our bags and went for lunch at a near by restaurant. The food was all right, but we were very hungry. From the window of that restaurant, we were treated to a wonderful rainbow…180 degrees + (see pic). By this time Gautam came to meet us at the restaurant and we accompanied him to the bikes. My Machismo 500 was looking good, but Keyur’s Thunderbird was looking a little worn out at first glance. We then took both the bikes to a mechanic, who was 7 km away from Darjeeling. I was only in tees and the weather was quite chilly being an overcast day. The mechanic (Mubarak) was very busy and was unhappy with Ganesh (Gautam’s assistant who accompanied us) that we’ve got the bikes so late in the day. Eventually he did do some stuff like change brake liners, grease the chains, change engine oils, fix electricals etc. By the time we left for Darjeeling, it was dusk and I was truly enjoying the weather. Upon reaching Gautam’s shop, we finalized some monetary formalities and took the papers, spares and a few other things like cords. We went to our lodge which was next to Gautam’s shop and docked ourselves after nearly 24 hours. Keyur kept me awake by being on the phone for nearly 2 hours after we were in bed. May 2: We were up at 5 30 am, and after managing with one bucket of hot water each, we had an early breakfast at the lodge prepared by the lodge owner. Breakfast remained fairly consistent over the next few days, consisting of bread, eggs, and jam. We then proceeded with our stuff to the bikes, to start with the dreadful exercise of tying everything on them. My bike did not have a carrier on it, Keyur’s did. So the poor guy was to ride an inferior bike with the load on it, and he had never ridden an Enfield before. The first time, it took us nearly 45 mins to tie the two big bags on his bike and one small one on mine. We left at around 8 am and wanted to fill fuel in our bikes, due to which we had to spend nearly 45 minutes extra in Darjeelin, thanks to the crazily organized traffic. When we finally exited the town, we saw more than one fuel pump there and we were kicking ourselves for wasting precious time. We were to ride in excess of 220 km today and reach the Indo-Bhutan border at Jaigaon. There are a couple of options when it comes to getting there from Darjeeling. 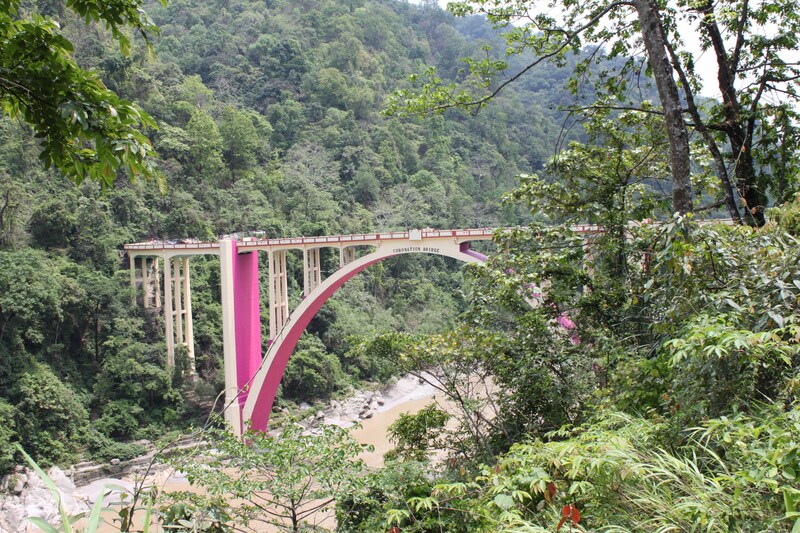 We chose to go via the ‘coronation bridge’ over the river Teesta, instead of another option which passed via Kalimpong. The third option is to go via Siliguri. 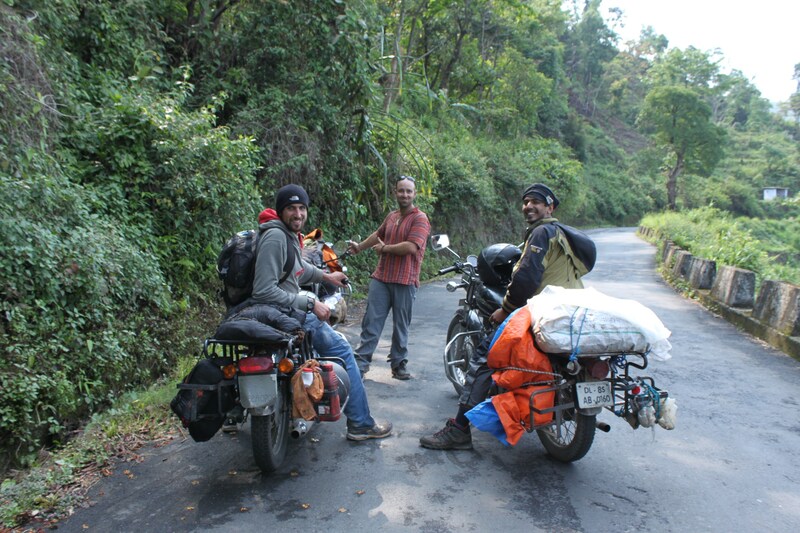 The road descending from Darjeeling to Teesta was very poor and we were tired in 30 km! Plus, since Keyur was not at all familiar with the bike, he was using his rear brakes excessively which resulted in them overheating and spewing smoke. We had to wait for a while for them to cool down and I asked him to ride the bike with the 2nd or 3rd gear engaged, and not in neutral to minimize brake usage. from which the road straight goes towards Gangtok, Sikkim, and if you cross it, you go towards Bagarkote and eventually join the Guwahati highway. We were of course to take this route. The road became narrower but was very green and scenic. Vehicles were few and after another hour or so, we hit the plains of north Bengal. It was warmer but very beautiful. The demographics of the people changed drastically once again, and all the boards were in Bengali now, instead of Nepali as was in the Darjeeling region. Majority of the roads were good and we crossed through a very dense forest, where I shot a video while riding the bike (which you can see in the My Videos section). After crossing the forest, we halted at a small village and had some mouth watering lunch. We knew we still had around 90 more km to reach the border town, so we continued without relaxing too much. The remainder of the journey was more of desperation, because we were very tired and were riding for more than 6 hours at that point of time. At around 6 pm, we reached the border town, which on the Indian side is called Jaigaon. It is a large and very commercial place because it acts as a trade hub for Bhutan. Full of trucks and diesel fumes, noise and filth. We clicked a few pictures at the gate which welcomes people into the Kingdom of Bhutan. There were some Indian tourists there, who were clicking pictures with the soldiers on either side. 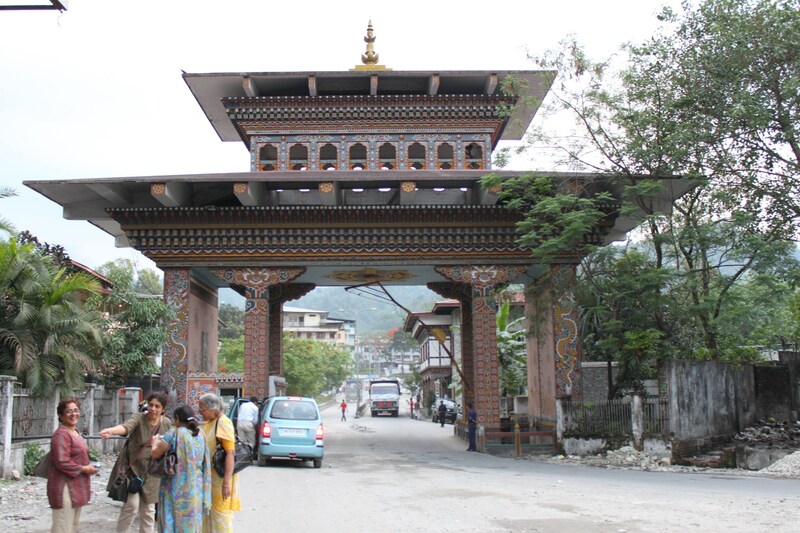 We took some pictures at the gate and then entered Bhutan, into a town called Phuntsholing. The first check-post was on the other side of the road, so we turned around for it, and while doing so Keyur took a wrong turn, which as an Indian rider he was probably not even aware of. In no time, a cop turned up and accosted him. On apologizing several times, the cop warned him and later added, “Aap itne bade desh se hain…itni badi gaadi leke aaye hain..thoda sa rules bhi follow karna chahiye na..” which translates into, “You are from such a large country and have come on such expensive machines, you ought to follow basic rules..”. It was almost a slap on Keyur’s face. Nevertheless, I went to the check-post to inform them of our entry into Bhutan. Permits wouldn’t be issued today, as the office closes at 3 pm. The officer at the check-post asked us to stay wherever we want (in Phuntsholing). We filled petrol in our bikes, which was Rs.53 a litre, much cheaper than India. So, most vehicles from Jaigaon, enter Bhutan, fuel up and then go back. This is because taxes are very low in Bhutan, on fuels and cars. We will talk about cars in a while. Phuntsholing was exceptionally clean and well organized. Vehicles were parked meticulously, with lady wardens guiding people wanting to park. We rode around a little until we found a decent looking hotel called Green Valley, where we decided to stay. The place was good and we negotiated for a discounted fare of Rs.600 (INR and Ngultrum are of the same value). The room was good, and we were very tired. It also had a geyser in it, which was a luxury for people from India. After freshening up, we went for a stroll outside and then I called my classmate Harish who stays and runs his business in Jaigaon. We met at his shop in the main market, and refreshed many a old memories. He runs a travel agency there, and his family runs a couple of other business on both sides of the border. They all stay in Phuntsholing, as it is a much better choice as compared to Jaigaon and is inexpensive. Indians can stay in Phuntsholing without any special permissions, but those who stay there are subject to the same rules like us when they want to go further into Bhutan. Harish and we had dinner at the same hotel where we were staying, after which we split and prepared ourselves for a tough day ahead, which would start with getting the route and vehicle permits and then riding all the way to the heart of Bhutan, Paro. May 3: We were up early, and had our breakfast at 7 30 am. By 8 am, we went to the Immigration office for our permits. The office would only open at 9 and so we just spent some time loitering around. Once the office opened, a guard gave us forms to fill and we submitted the application along with our identity proofs to the officer, who requested us to collect our permits in an hour. We got the permits, but it was only for a duration of 7 days, and we needed it for 11 days. This meant that we would need to extend our permits at Thimphu, which wouldn’t be a big deal since we would have had to go to the Immigration office there for restricted area permits anyway. So by 11 am, we were ready to now apply for route permits for our bikes, which are issued by the RSTA (RTO equivalent). On reaching the RSTA office, we were advised that we need to draft an application requesting for the permits and attach all relevant papers (Copy of Driver’s Licence, RC, and Insurance). The process was complicated and I had to shuttle between windows, and also had to deal with a senior official who refused to entertain me because I was wearing shorts. There were boards (see pic) everywhere requesting vistors to wear formal (at least semi formal) clothing while visiting the office, but that one would only know after reaching there. Bhutanese take great pride in their dress and culture, and all locals as well as officials have to wear the national dress while in the office premises! Finally, we got the permits and we hurried back to the hotel to tie the bags on the bikes and leave, hoping to reach Paro before dark. We finally got moving and exited Phuntsholing at around 1 pm and came across the first of the many check-posts that were were to encounter. One needs to register the person and the bike permits separately. We continued hurriedly, spending minimal time admiring the surrounding beauty, which was increasing significantly with passing time. We passed the a village called Sorchen and suddenly the weather turned very cloudy and foggy. It was so foggy that I had to ride at 15 km/h and had Keyur follow me very closely. This lasted for nearly 30 mins until we reached a major town called Gedu. We stopped a little before Gedu and decided to have lunch there. Lunch was the staple diet of Bhutan, comprising of chillies and cheese. It was terribly spicy of course but I loved it. Keyur had smoke bellowing from his ears. After the lunch, the family (who was very friendly) posed for a picture with us (see pic). Gedu is a important place because it has a college there which offers modern courses like BSc and BBA amongst other common graduation courses. I met a few students there who agreed to pose for a picture. We moved further. The road was in very good shape all the way from Phuntsholing. As some of you might be aware, all the roads in Bhutan are built by the Border Roads Organization (BRO), a wing of the Indian Army. This is one of the many things that India does for Bhutan, the other major one being building power plants, including the recent one called Tala Hydroelectric Project, of which there was a sign board at Gedu. I ride substantially faster than Keyur, owing to expertise and a superior bike, so I reached the next village of Chukha before him. I spent some time talking to the GREF soldiers posted there, and in about 10 minutes Keyur passed me, to whom I signalled with a ‘Thumbs Up’ which meant continue, don’t halt. I stretched my body a little more in the fading sunlight, and then continued descending sharply into the Chukha valley. The road suddenly disappeared and for nearly an hour, we were riding on very bad roads (due to construction activity). The light was fading fast, and I was imploring Keyur to go faster. The poor guy was riding a Bullet for the first time, that too on such terrain, was unfair of me to ask him to speed up repeatedly. We had covered around 120 km when there was only about 15 mins worth of light left. We decided to exchange bikes, because the bike Keyur was riding was not in very good shape, and was without a proper headlight. So Keyur had his moment of glory when I kick started the 500 for him, and followed him closely on the Thunderbird. It took us an hour and half to reach Paro, and the journey was quite difficult. On reaching Paro, we docked at Hotel Perjoling where we had some good food before crashing into our beds. We were to spend the next day exploring Paro and nearby areas, so we could have the luxury of sleeping to our heart’s content. May 4: We were up and ready by 8 am. I went for a stroll outside and clicked some pictures. The weather was lovely. Today we were to visit the Drugyel Dzong, 18 km from Paro and the famous Tatshang gompa (Tiger’s nest monastery). If time permits, then we also planned to visit Chela La top, which is a high pass on the way to Haa. After having our standard breakfast of bread, eggs and jam, we moved on one bike towards Drugyel Dzong. The scenery was splendid, and in some time we could see the Tatshang gompa nestled in the mountains on our right. We reached the Dzong in about 30 mins, and started exploring it. It was in partly in ruins, which is not how most Dzongs in Bhutan are. Despite being abandoned after a massive fire in 1951, the Drugyel Dzong remains an impressive sight. We spent around an hour exploring the area, and I made a small video (available in Videos section) showing around the magnificent location. We exited the Dzong and I noticed a Border Roads Organization (BRO is an Indian Army division) sign post there. The project under which BRO builds roads is called Project Dantak (on the lines of the famous project Himank of Ladakh). Other areas where India contributes is infrastructure, education, and training of the Bhutanese army (this happens at a town called Haa). The Indian Army’s division which is posted in Haa is called IMTRAT, and at multiple junctures during my trip, I was asked if I belonged to IMTRAT. We left the Dzong and proceeded towards the base of the Tatshang gompa. Bhutan only allows a handful of foreign tourists (9000 I am told) every year, who have to pay an exorbitant $200 a day and must be part of a recognized tour package. So, we had seen only a few foreign tourists till now but when we reached the base of the Tatshang gompa trek, there were at least 30 SUVs parked there, which gives you an idea of how popular this place was within Bhutan. Don’t be astonished about the number of SUVs, Bhutan is the land of SUVs! The gompa is a 3 hour trek from the base. Most foreign tourists are old retired couples (who can afford $200 a day) and as soon as we started the trek, the ones to cross us started warning us about the intensity of the trek. Since Keyur and I are both mountaineers, we received the comments with a smile and continued. The trek is scenic and by the time we reached half way, it started drizzling which soon translated into a severe hail storm. We were caught there without any shelter, and minimal protection as far as gear was concerned as well. Soon we saw people descending rapidly, hoping to get back to the warmth of their SUVs quickly. We were the only ones who continued ascending. In about an hour, Keyur was completely drenched too, and the hail stones weren’t helping his motivation levels. He suggested that we drop the plan and return, but I kept insisting that we will make it. The weather stabilized in some time, and we reached the highest point of the trek, from where the gompa was opposite us (see pic). But a 700 step descent followed by an equally gruesome ascent awaited us. low light photography is really my strength. We returned to the lodge, and I joined Keyur and the ladies for a short while, before we walked them to their lodge which was nearby. We had dinner and after a hot water bath crashed in our beds. We were to proceed to the capital city of Thimphu tomorrow. May 5: We were up and ready by 7 30 am, after which we had our standard breakfast. By now Keyur was getting better at helping me tie the bags on the bikes, but it still was something we both did not look forward too. We left for Thimphu, riding along the excellent road, part of which we encountered while coming to Paro. Thimphu was barely 50 km from there and since we were moving along quite swiftly, in no time a board welcomed us to Thimphu city, which was immediately followed by a small ‘Chorten’. A little further, the road split one ascending up to Simtokha Dzong and further into Wangdue, and the other descending into the Thimphu valley. Keyur was in racing mode and was riding at 80 kp/h+ before I slowed him down warning him about the condition of his bike. We also tried some coordinated stunts while riding through a few empty patches. In another 15 minutes we reached an area which appeared to be the main street/square of Thimphu. The traffic was being managed meticulously, and we had to park our bikes very carefully. I had Keyur watch over the bikes and the luggage and I went around checking for some hotels. The place was so clean and well managed (the city I mean) that I was already in love with it. I finalized a hotel called Norling, which was just after the main junction (there is one main road and one main junction, that’s it). We parked our bikes in an area earmarked for that purpose, and by now people around were looking at us and our bikes curiously. The Delhi registration plates made it more obvious that we were coming from some place very far. We dismounted our stuff from the bikes and checked in to the hotel. Rested for a while, took a hot water bath and went out to explore the town. The weather was lovely, streets were clean, traffic very well organized…seemed like we were in Europe. 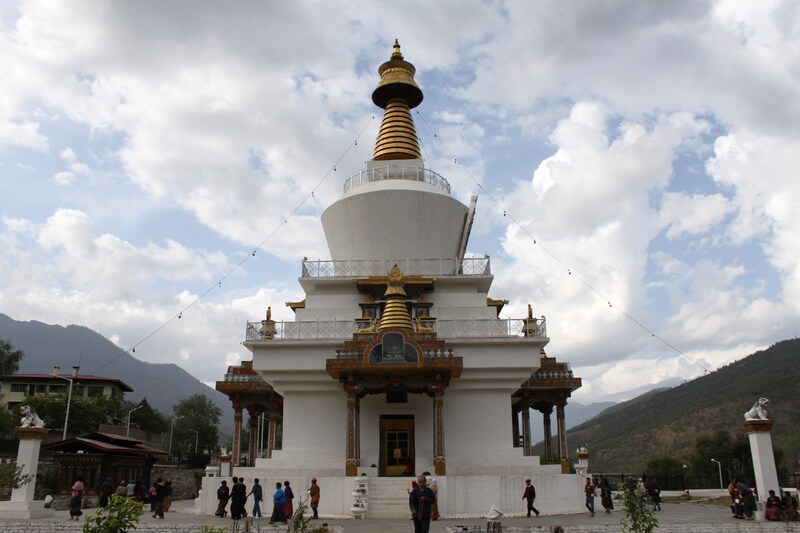 We first visited the main Chorten (Buddhist temple) of Thimphu. There were several people there, some who were meditating, and most who were going around the structure clockwise (parikrama) while praying. There were a few other tourists as well. People were dressed in their traditional outfits, which added to the splendour of the place. (pics) At the gate of the Chorten, I met the first beggar that I’d seen in Bhutan so far. Then we headed to a small hill on perched on which is a huge statue of Gautam Buddha. The climb was pretty gorgeous itself, and we could see a number of SUVs crossing us, which effectively meant that the place is a foreign tourist attraction. There was construction in progress work where a huge pedestal was being constructed below the statue. The workers were all from India and Nepal. The view of the Thimphu valley and the city was magnificent. The statue looked better from a little far away actually, because of its size. We then went back to the main market, and spent some time exploring it. This included visiting the Indian embassy which is known as the Nehru-Wangchuk center. The Indian embassy has a well equipped library, which benefits several Bhutanese students. I also met a man who was attached to the embassy, and was a Indian classical music teacher. The purpose of his being there was to promote our music in Bhutan. He said that the response from the Bhutanese was heartening, and his classes were generally full. In the evening, we had our dinner at a hotel named Tandin, just opposite our hotel. Tandin served the best food I had anywhere in Bhutan, and we eventually ended up eating all our meals there! That night when we were walking around the empty streets, we met a white monk (Lama). Upon interacting with him, he told us that he lives here in Bhutan and helps the locals overcome drug problems. I had a very healthy conversation with him, and he told us that we can continue our chat the next morning at a cafe (name needed) nearby, over break fast. May 6: In the morning, we went to Ambient cafe for breakfast. The decor was very elegant; with most of the furniture made up of cane. It had a European feel to it, and most of the people there were indeed foreigners. We were having our breakfast, and the Lama showed up. He was carrying his own breakfast; but since he was known and respected by everyone around, he could sit with us and have it. We talked a little more about the problems that plague Bhutan, apart from the drug abuse thing he had mentioned last night. I also asked him where people got the money to buy all these SUVs (every second car in Bhutan is a Toyota Landcruiser); and he said that this was another problem where in people don’t live within their means. Most of these cars were loaned, and in a lot of cases, the buyers go bankrupt. We exchanged contact details and wrapped our discussion. We had to go to the immigration office and to RSTA to extend our route and vehicle permits today. The procedure was simple and the staff was very helpful. All the officers in the immigration office were women. We also had a chat with the senior officer there, who wanted to meet us before approving our permits. He was a very kind gentleman. After getting the extended permits, I went to RSTA office to extend the vehicle permits. Again, the procedure was simple and the concerned official just stamped and extended my existing permit by a week. He discussed my route with me and showed me some maps, and also gave me his contact number in case we needed any help along the journey. We had our lunch, and rested for a little while before heading to an exhibition/fair that was being held at the main square. The objective of the fair was to raise money for charity. We enjoyed looking at all the young men and women (Bhutan is one of the youngest countries in the world as far as median population age is concerned) and visited most of the stalls. 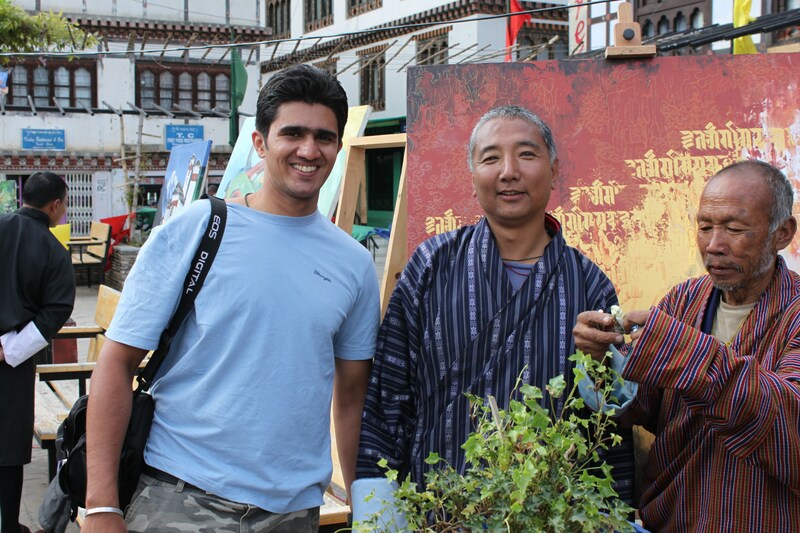 I also met one of Bhutan’s most renowned artist, and clicked a picture with him. His painting of Buddha behind us in the picture was astounding (see pic). In some time, we left for visiting the Thimphu Dzong (Trashichodzong), which is open for visitors between 5:30 and 6:30 pm, if I remember correctly. The Trashichodzong, or the fortress of the glorious religion, is the seat of government and the headquarters of the clergy in the capital Thimphu. The original dzong was built in 1216. It suffered three major fires over the centuries and was rebuilt three times. 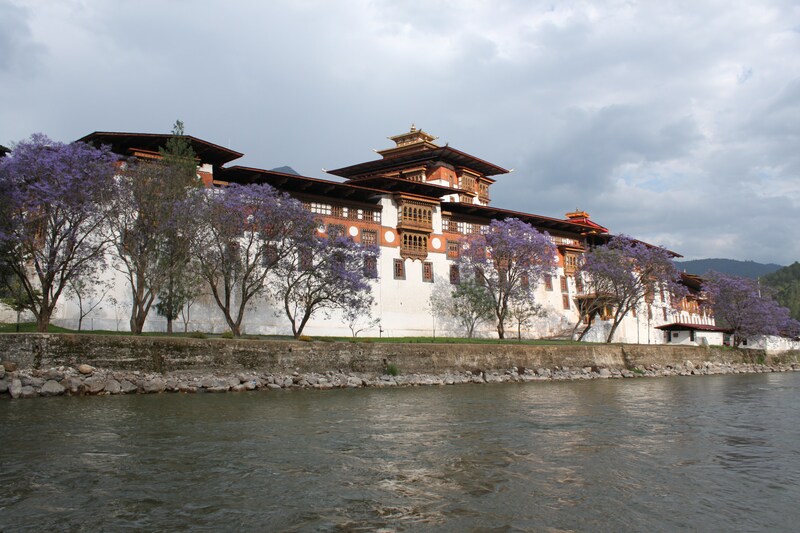 It was enlarged in the 1960s to become the symbol of the new capital after Punakha. This dzong housed the original National Assembly of Bhutan in one of its temples. 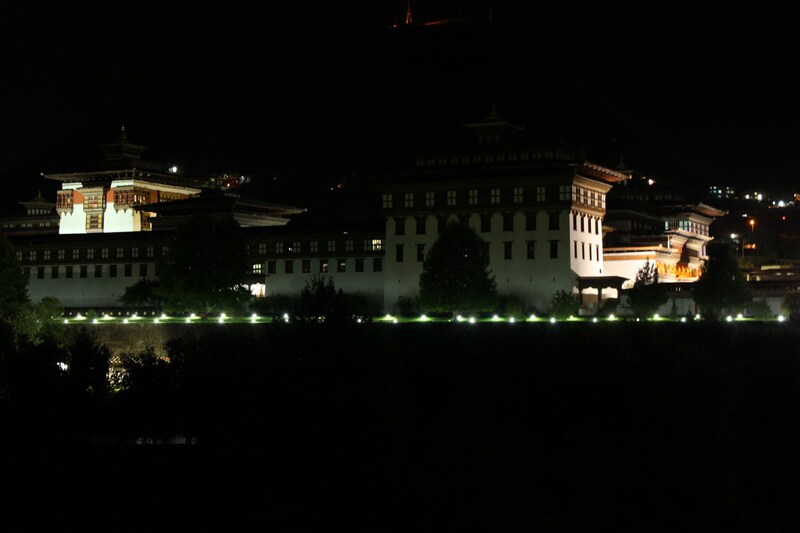 It still houses the secretariat and throne room of the King of Bhutan and the headquarters of the Royal Government’s Ministry of Finance and the Ministry of Home and Cultural Affairs. The Dzong is the summer residence of the clergy. 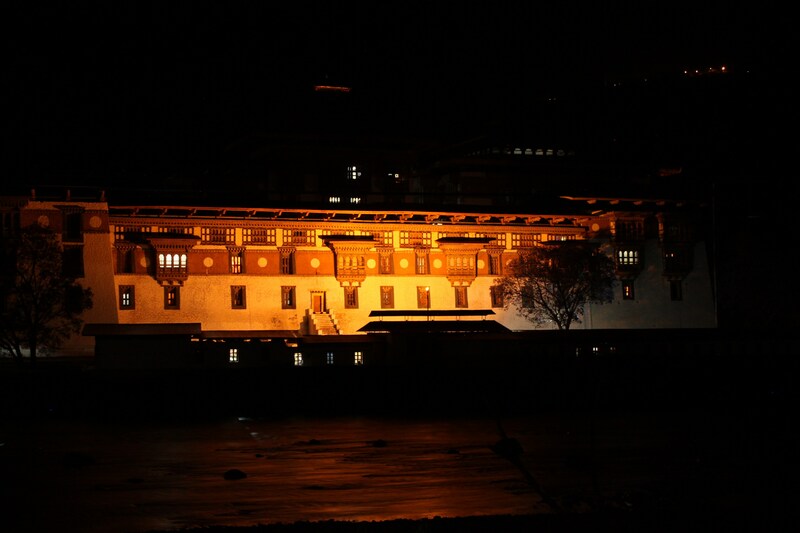 Opposite the Dzong is the newly constituted parliament building. besides the parliament building. A curious police constable spotted me and was a little taken back at first, before realizing that I was a harmless tourist. I returned to the hotel where Keyur was busy watching an IPL match. We chatted for a while and slept. Tomorrow morning, we were to visit the Simtokha Dzong on the outskirts of Thimphu and then proceed to Punakha. May 7: We were up and left for Simtokha Dzong at 8 am. Before leaving though, we had some freshly baked pastries at the popular Swiss bakery in Thimphu. Simtokha Dzong is located around 5 km south of Thimphu city center. Simtokha Dzong officially known as Sangak Zabdhon Phodrang (Palace of the Profound Meaning of Secret Mantras), was built in 1629 by Shabdrung Ngawang Namgyal. 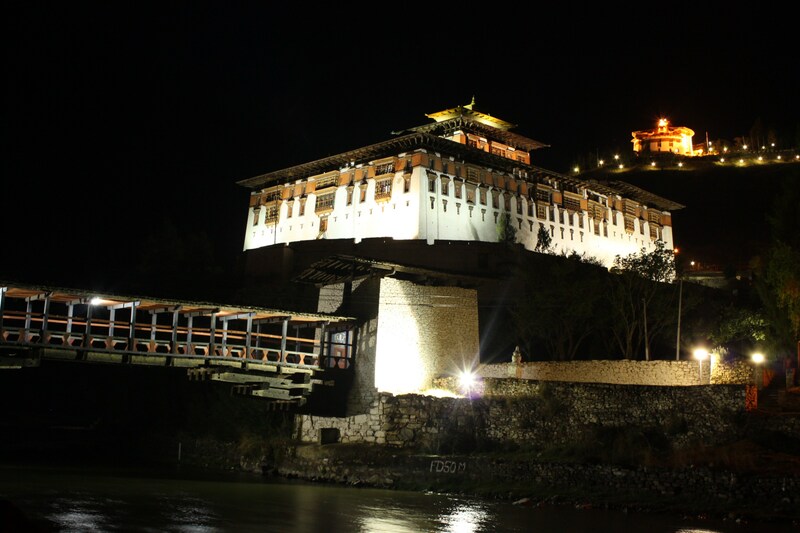 It is often said to be the first dzong built in Bhutan. In fact, there were dzongs in Bhutan as early as 1153, but this is the first dzong built by the Shabdrung, is the oldest that has survived as a complete structure, and is the first administrative facilities. It is the home of the Institute for Language and Culture Studies; the students are both monks and lay people. The site is said to have been chosen to guard over a demon that had vanished into rock nearby, hence the name Simtokha, from simmo (demoness) and do (stone). Strategically, the site is also important because it protects the Thimphu valley, and the valley leading to the Dochu La and eastern Bhutan. The Utse (main structure) is three floors high and behind the usual prayer wheels around the outside there is a line of more than 300 fine slate carvings of painted faces depicting saints and philosophers. The large central figure in the central Lhakhang is of Sakyamuni; he is flanked by images of eight Bodhisattvas: Jampelyang, Channa Dorji, Chenresig, Jampa, and the less familiar Sai Hingpo (Shritigarva), Dupa Nampasel, Namkhe Hingpo (Akash Garva) and Kuentu Zangpo. The paintings inside this Lhakhang are said to be some of the oldest and most beautiful in Bhutan. One of the Lhakhangs, Gen Lhakhang, may be visited only by lamas. In the west Lhakhang chapel are paintings of Chenresig, green and white Taras, and an early painting of Shabdrung Ngawang Namgyal, which was restored and cleaned in 1995. Large paintings of mandalas and the guardians of the four directions adorn the gorikha (veranda). During it’s construction Simtokha Dzong was attacked by Tibetans and five Bhutanese lamas who were opposed to the Shabdrung’s rule. The attack was repelled and the leader of coalition, Palden Lama, was killed. In 1630 the Tibetans again attacked and took control of the dzong. The Shabdrung regained control when the main building caught fire and the roof collapsed, killing the invaders. Descriptions of the original Simtokha Dzong were provided by the two Portuguese Jesuit priests who visited here in 1629 on their way to Tibet. Expansion and restoration of the Dzong was performed by the third Druk desi, Mingyur Tenpa, in the 1670s after Tibetan invaders attacked it in 1630. It has been enlarged and restored many times since. The current restoration project is funded by India. We spent around an hour exploring the place and clicking pictures with the happy to pose monks. I also tried speaking with a few of them but most of them knew very little or no Hindi/English. We then continued our journey towards Punakha which was another 4 hours away. The road (which really is the only road in Bhutan that goes from Phuntsholing to Trashigang) is the same which heads to Wangdue. We crossed one of the highest passes in Bhutan called Dochu La, which was a very scenic place nestled between the clouds at around 12000 ft. The route splits from a town called Metshigna from where we headed north for around 40 km. A little closer the Punakha, the views started getting very scenic and we crossed another small village called Khurthang. 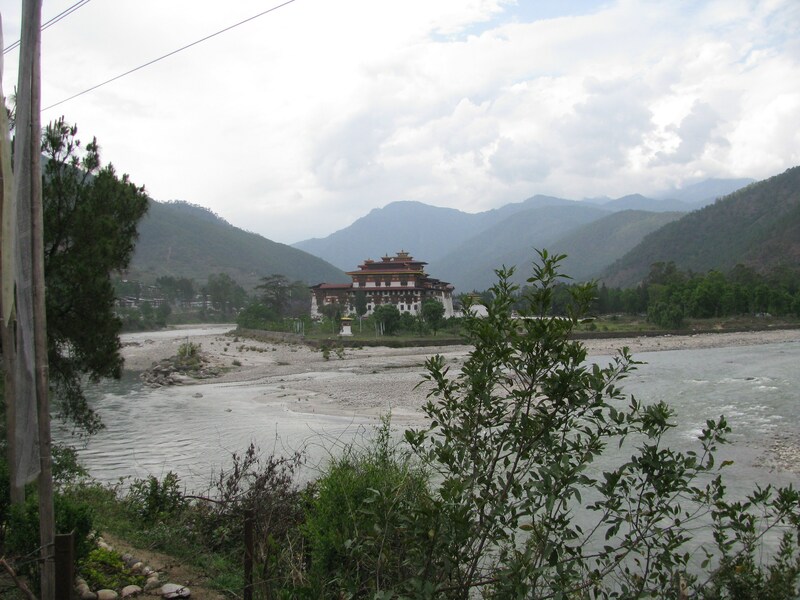 The sight of the Punakha Dzong standing in at the intersection of two rivers was extra ordinary (see pic). We were already in love with it, and upon going a little closer, we couldn’t take our eyes off it. We parked out bikes and went inside the Dzong. I cannot describe the beauty of the place, with flower laden trees bordering each side. The location, just next to the river made it look divine. There were quite a number of tourists inside, and one wouldn’t be surprised by that. We explored the dzong from both outside and inside it. A tourist guide (attached to a Belgian group) gave me some valuable insights about the dzong. I made a couple of videos which are available in the Videos section of this site. 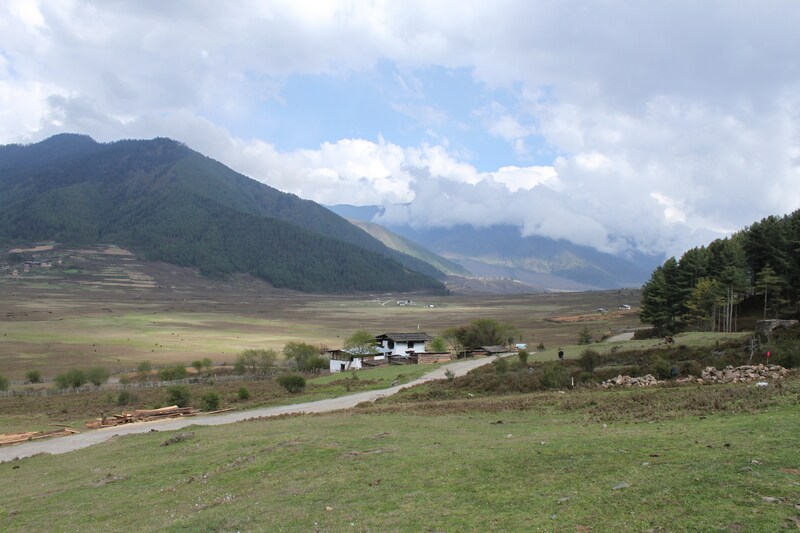 The road further from Punakha leads straight to Damji, in the heart of the Jigme Dorji National Park. When we exited the dzong, the sun came out for a just a bit and I quickly descended to the river bed to get a perfect shot of the Dzong, which was this (see pic). and asked me if she should carry my bag to the room, and I told her I don’t want to be accused of burdening a child to death! We had our evening tea and spent some time exploring the town. Later in the evening we spent time mixing around with the owner and the staff who cooked some terribly spicy food for us. 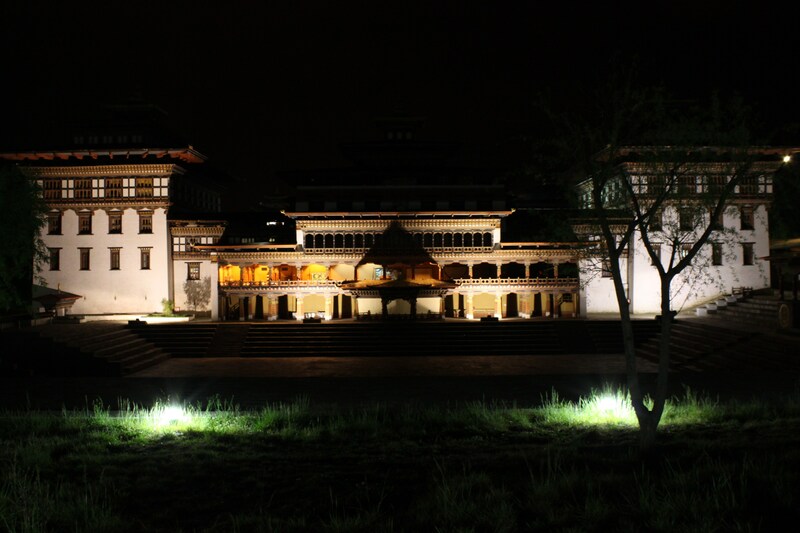 It was drizzling, but I had plans to go back to the Dzong for a few night shots. I took a chance and went to the Dzong, and quickly got a few shots of the place. It looked so beautiful….here is a nice picture (see pic). The rain had picked up again and I just managed to keep my camera dry while returning to the lodge. We slept at around 10 30 pm after a truly wonderful day. May 8: Today we were ready by 8 30, after being treated to some nice breakfast by our hosts. They were actually quite sad to see us go so soon, and we too wished we could spend some more time there. We were to ride in excess of 100 kilometers, and venture deep into the heart of Bhutan, into Phobjika valley. Phobjika valley falls under the Wangdue dzongkhag, which were too cross on our way. It is the richest region of Bhutan as far as flora and fauna are concerned. 100 km to people who know my biking potential might not seem much, but we were quite fatigued by now, and the mountainous roads are tough to ride on. Within 20 mins of leaving my spine and cervical collar joint were aching badly. A little before Wangdue we had our first casualty, my front tyre punctured. I opened the tool kit confidently to realize that the appropriate spanner for removing the front wheel wasn’t there. Lucky some passing kids guided me to a truck workshop nearby, from where I managed to get a mechanic who did a fantastic job of fixing the puncture in just around 1 hour. We reached Wangdue and decided to skip the Dzong in the interest of time that we lost on account of the puncture. Little did I know that I will be forced to visit it in a couple of days! After crossing Wangdue, the road became a little difficult to navigate on, and the quality of the surface deteriorated as well. The road started ascending because we were climbing the Lawa La pass, on the top of which splits the road into the Phobjika valley to the south, while the main road continues towards Trongsa. We took the right turn, and all of a sudden the weather became very chilly. It was also drizzling lightly, which was adding to my discomfort. We started gradually descending, and the landscape resembled that of an high altitude area with moraine and yaks on both sides. We descended quickly and in about 20 minutes we could see the low lying valley. It looked amazingly beautiful from up there, because though we were in a cloudy area, the valley was glittering in all its glory with sunlight. We reached a small village a little above the actual valley called Ganti Gompa. We had a choice of either staying there, or all the way down inside the valley, which is what we decided to do. We had almost completely descended into the valley. The views were gorgeous, with animals grazing freely, and the sun light making the setting look straight out of a fairy tale (see pic). Phobjika isn’t one village, it is the name of the whole valley and we were now looking for some sort of accommodation options. We met a solo American traveller who was on her way back in an SUV. She told us about the place she stayed at, and that is where we went. This particular lodge was on a small hill, some hundred feet above the main street. I walked (trekked!) up to the lodge to inquire if there were rooms, which there were. So I took my bike up first, then had to go back to take Keyur’s bike up there, because there was no way he would have managed that incline with all the bags etc. We negotiated the price and checked into our room. It was a spacious wooden room, which had a fireplace too. The view from the room was magnificent, and thought the weather was a little overcast, it was fantastic. We had lunch in the kitchen/dining area after which I went for a stroll through the valley while Keyur rested a little. Words cannot describe the beauty of the valley (see pic), so I will not attempt to do the that. After clicking several pictures, I returned to the room where Keyur was trying to light the fireplace. It wasn’t cold (not yet at least) but I guess he was enjoying the experience of lighting it more than the utility. Then all hell broke loose. Since it was drizzling, and the rain generally picks up after dusk, I went outside to move the bikes into a covered area to realize that my bike’s rear tyre was flat this time! I panicked. After discussing the matter with the lodge owner, I removed the wheel and managed to fix the puncture myself, but our hand pump was no good in inflating the heavy rear tyre. The next shocker then came to me, that the nearest puncture shop/air pump was either in Wangdue or in Trongsa, both 100 km away! We had no other choice. Tomorrow we were supposed to leave for Trongsa/Bumthang, but this would effectively mean that the whole of tomorrow would be spent in fixing the puncture, so we had to drop the plan to go further. After dinner we slept, with me knowing that I had a tough day ahead. Some where around 2 am I woke up to see Keyur’s silhoutte against the dim fire place. He was obsessed with the fire. I just sighed and slept again till about 6 am. May 9: I woke up and got some news to look forward to. The father son owner duo of the lodge were on their way to Wangdue, so I could get a lift along with the wheel. I had another idea, I asked them to take the wheel and meet me at Lawa La pass, and I took Keyur’s bike till there. My plan was to leave Keyur’s bike at the pass (where the road to Phobjika splits from the main road) so that while returning from Wangdue, any vehicle going towards Bumthang, Trongsa and Phobjika would suit me. So we left, they in the car and me on the bike against the bitterly cold morning. The ride till Lawa la was terrible. It was cold, the bike was not that great and the road was poor. Plus I had to be quick because the lodge owners were in a land cruiser and I didn’t want them to wait for too long at Lawa La for me. I parked and locked the bike at Lawa La pass, against the advice of the lodge owners. I was prepared to take the risk of not getting robbed in Bhutan! We left for Wangdue in their car, and reached there in about 2 1/2 hours. There was a section in between where road building (so rock cutting) activity was in progress, and this section remains closed during most of the day apart from specified timings. I made note of the timings because I had to return the same way to. The lodge owners dropped me to the mechanic’s shop, and told him briefly about me and why I was here. The mechanic was helpful and he fixed the puncture in about an hour. It was around 11 am now. I had to figure out how to return to Phobjika now. I picked up the heavy wheel (it was terrible) and walked towards the main road. In some time, I got some one to give me a lift till the Wangdue bazaar (market) where there was a petrol pump as well as the transport stand. I filled some petrol in a bottle (Keyur’s bike was short on petrol and we hadn’t tanked up in Wangdue unaware that there was no petrol pump till Trongsa) and started inquring at the stand for options on getting back to Phobjika. There were no shares taxis and I was told that the last bus for Bumthang/Trongsa left 5 minutes before I arrived. I had to spend almost an hour before I managed to get hold if a goods carrier, on way to Trongsa, to drop me till Lawa La. There is nothing worth mentioning about the return journey, apart from the fact that we crossed the section, where road construction work was in progress, in good time. The driver’s house was en route, and we stopped there for a little while. His grand daughter, 3 years old, joined us in the vehicle. Later he told me that he was carrying supplies to his sister’s hotel which is a little after descending Lawa La. After 3 1/2 hours, we reached Lawa La, where I thanked him and alighted. The bike was intact. I filled the petrol I was carrying in it and tied the wheel on to the carrier. It took me another hour to reach Phobjika, where Keyur was enjoying his spare time. After struggling for another hour, I managed to fix the wheel on the bike! It was nearly 5 pm by the time I freshened up. We went for another stroll behind our lodge (some thing of a mild hike) and returned in an hour. Since we had lost one day on account of this puncture, there was no way we could make it to Bumthang. I did have the thought of asking Keyur to return while I went at least till Trongsa, but was wary of letting him ride individually, after witnessing what even a small problem like a tyre puncture could result in. We spent the remaining evening relaxing and had our last dinner at the lodge by 7 pm. There was a group of Japanese travllers who had also arrived (they were shooting a documentary), and there was another Indian family who had come there with their tour guide. Over dinner we interacted with all of them, and were in our room by 9 30 pm. May 10: So, we were not going to make it to Bumthang, which meant we had to start our long journey back to India, with Thimphu being the destination for today. The ride to Thimphu was of approximately 6 hours, so we were a little relaxed in the morning and left at around 9 am. So, I was back on the same road for the third time in 2 days! We crossed Lawa La, and reached Wangdue in 3 hours. We continued without waiting there for too long and in about 4 1/2 hours I reached Dochu La pass. Keyur was approximately 15 minutes behind me. It was drizzling lightly, which was a common feature at all the passes. By the time Keyur reached, it started raining a little heavily, and we decided to descend quickly hoping that the whether would clear as we lost height. But in no time, the rain turned into a storm. Keyur was ahead me, and I had to stop immediately to protect my bag and other exposed stuff like the camera, GPS etc. I took shelter below a tree, but soon realized that wasn’t going to help. Somehow managed to protect the bag on my bike by covering it with the tarpaulin sheet that I was carrying. Keyur was no where to be seen and I was just hoping that he would have stopped somewhere too, because the rain was freezing cold, making the bike very difficult to handle. I stopped a passing bus and told the driver that if he spots a biker further down, tell him to wait till I come there. I had to wait for another hour, before the down pour slowed down a little. I was freezing, and was drenched from head to toe. The bike was very difficult to handle, with the brakes being much weaker than normal. After descending for about 20 minutes, I caught up with Keyur. I was relieved to see him safe, though he was in a lot of discomfort due to the cold water. His bike was also far more difficult to handle than mine. We had some tea and continued our journey further. In another 1/2 hour, we reached Simtokha dzong, which was essentially the gateway to Thimphu. In the distance, I could see the statue of Buddha perched at Buddha point, glowing with the sun rays falling on it. It looked divine, and more so because it was cloudy where we were standing. We reached Thimphu in another hour, tired, and drenched. We checked in to the same hotel, Norling, freshened up and had our lunch at Hotel Tandin again. We were quite exhausted, so we rested till evening. In the evening, I went to a bookstore where I ended up buying 9 books. I spent nearly 3 hours there, and had great conversations with the lady who owned the store. Her daughter, who joined us later, studied in Pune. 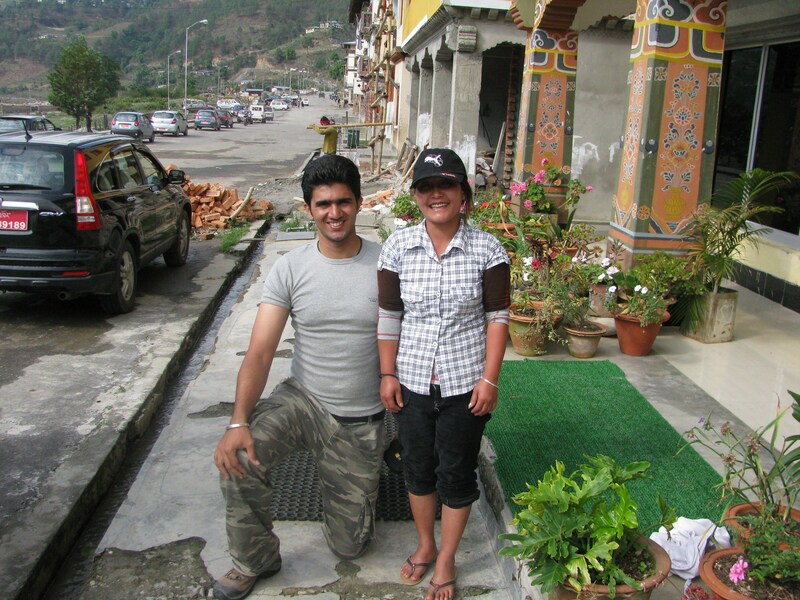 What that resulted in is…that her friends, who still study in Pune, had come to to Bhutan. So I requested her to send the books with her friends, because I didn’t have space for 9 books in my bag. So, while I write this travelogue, I am expecting those books to arrive by next week. We had dinner, predictably at Tandin again. At night, we explored the option of going to Phuntsholing via Haa. Haa is a remote valley near Paro, which is off limits to tourists. I had arranged for the permissions though, and could go there if we pleased. Keyur wasn’t sure though if he could manage the extra 100 km that would be added to an already long ride; and I didn’t want to go solo, leaving Keyur unaccompanied. Finally we decided to chuck Haa and use the extra day in Darjeeling, to relax. May 11: We had breakfast and left for Phuntsholing at around 9 am. The return journey passed swiftly. Two hours into the day, we were forced to stop for nearly an hour and a half because the road was closed as rock cutting was underway. During this forced stop, I met the two BRO officers there and had a nice conversation with them covering a host of topics. Finally we managed to squeeze our way through the freshly blasted rock face. There was quite a chaos there, and we had to keep ourselves ahead the whole traffic build up, because overtaking the hundreds of trucks that followed us, would have been a nightmare. After another two hours, we stopped at a village for lunch. The restaurant was a little above the road, and had a nice porch. I lay there soaking the run and straightening my back, while Keyur joined me in about 15 mins. We had lunch and continued our journey. The next halt was at at Gedu, and then a little before Phuntsholing. We were VERY tired, and we actually lied down on the road 30 km before Phuntsholing. We reached Phuntsholing at 5 pm, and checked in to the same lodge where we stayed while we first got here. After relaxing for a while, I caught up with my friend Harish in Jaigaon. I also picked up some engine oil, as Keyur’s bike was spewing oil through the exhaust, and had to refill oil to keep the performance near normal. The plan for the evening was to have food at Harish’s house which incidentally was very close to the lodge where we were staying. After food, we slept like we hadn’t during the whole trip. Tomorrow was going to be another long day, from Phuntsholing to Darjeeling. May 12: We bade adieu to Bhutan and at 8 30 am left for Darjeeling, through the Jaigaon, Hasimara, Dhupgiri, Oodalabari and Siliguri. The journey was pleasant, apart from the occasional irritating drizzle and maniac drivers. We missed the bifurcation for Darjeeling via Teesta (the one we came from), so took the third route via Siliguri. The initial section of the ride from Siliguri to Darjeeling passed through a section of the Mahananda WLS. It was extremely beautiful, and the road was excellent too. The narrow gauge track of the toy train was playing hide n seek with us continuously (see pic). Half way to Darjeeling, we met a couple of other bikers, both Daniels and both from England (see pic). We spoke to them for some time, and then all four of us continued towards Darjeeling. Four thumpers (Bulleteers) instead of two made the ride better, and definitively more attention grabbing with children waving to us at every passing village. Another section of road was being constructed, and we had to take our bikes through ‘very difficult to maneuver slush’. I just managed to make it, but the others had a lot of trouble crossing that section. Just while entering Darjeeling, one of the Dan’s bike refused to move. The clutch gave away. I managed to take them to a mechanic and went to finalize a lodge in the meanwhile. I finalized Andy’s guesthouse, close to Gautam’s shop. I returned to the mechanic to fetch the other guys, after which we retired to our rooms for a couple of hours. Later I caught up with Gautam and narrated him the story of our successful journey. He was busy so we decided to catch up tomorrow. All four of us (Dan*2 Keyur and me) had our victory dinner at Glenary’s, which is the most popular restaurant and bakery in Darjeeling. We slept early, not bothered about when we would wake up the next day, which was our spare day in Darjeeling. May 13: I woke up at a leisurely 8 am with Keyur still snoring. Had a hot water shower and then headed straight to Glenary’s for freshly baked breakfast. We quite really feasted there, seated by the window-side. The demographics of tourists changed so drastically, with Darjeeling (and particularly Glenary’s) full of foreign and domestic tourists. Later we went to Tiger Hill, the vantage point near Darjeeling which offers good views of Kanchenjunga, but returned empty handed as it was very cloudy when we reached there. 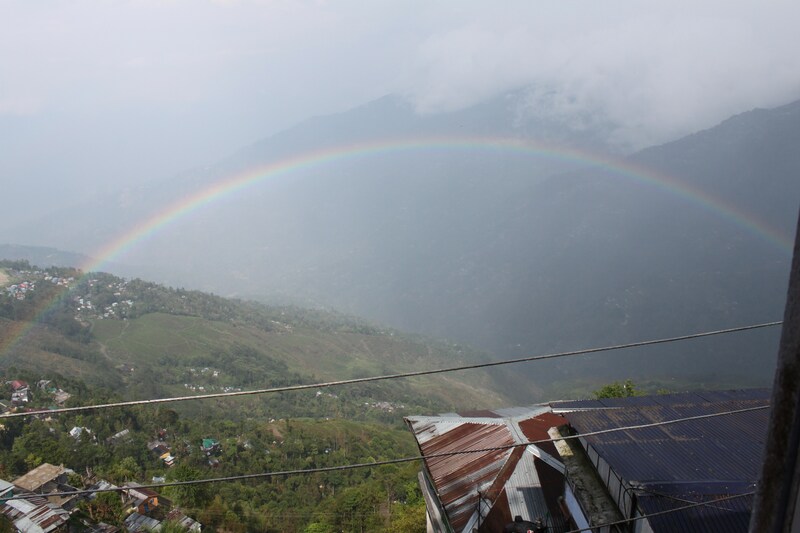 We returned and wandered around Darjeeling, shopping for some stuff and had our lunch. We rested for a little while in the afternoon. Dan*2 woke up only at about 2 pm. They were so fatigued, that they just didn’t have any inclinations of getting up today. The evening passed quickly too, and I spent most of my time at Gautam’s shop. We decided to have a small get to together at Gautam’s shop after 8pm (after it shuts down). So in the evening, all of us, Gautam, Dan*2, Gautam’s assistant Ganesh, friend Samik and a few other foreigners packed the small seating area of Gautam’s shop. Conversations, music and alcohol flowed through the evening. Gradually a few people left, and then it was just us, the close friends. Then the best thing of the trip happened. Samik had a French friend, named Flo with him. Casually Gautam told me that he has spent all his money and doesn’t have money to return to France. He has a 1977 Bullet (sold to him by Samik), but no one is willing to buy it here, as only a bike lover would be interested in such an old machine. I was curious and checked out the bike, which obviously wasn’t in a great condition. But something went wrong in my brain, and I paid Flo all the money cash, there and then (borrowed partly from Keyur and Gautam) and bought the bike! So I was leaving for Pune in approximately 8 hours, and I just bought a 1977 Bullet without even riding it. I just kept the papers with me, while Gautam and Samik said they’ll help me send the bike to Bombay by train. So to keep it short, today as I write this travelogue, the bike is with me in Bombay, and is undergoing an overhaul at my trusted mechanic’s garage. We called it a night at around 11 pm, and all of us went our ways. Keyur and I returned to the lodge and had a sound sleep (beer helps). Before sleeping though, I met girl from Nagaland who was staying in the adjacent room. She was in Darjeeling to study organic tea cultivation in the Makaibari tea gardens. Her family has tea gardens in Nagaland and she wanted to implement organic farming there. May 14: We were up and ready by 6 30 am, as we needed to leave for Bagdogra to catch our 1 30 pm flight for Delhi. We left for the main market, from where we got onto a shared taxi for Siliguri. The journey was boring, apart from a few patches where we passed by tea gardens. I got a few packets of organic tea for home, and in 3 1/2 hours, we reached Siliguri. Since we had time on our hand, I decided against taking a dedicated vehicle for the airport, which was around 12 km away from where we were. 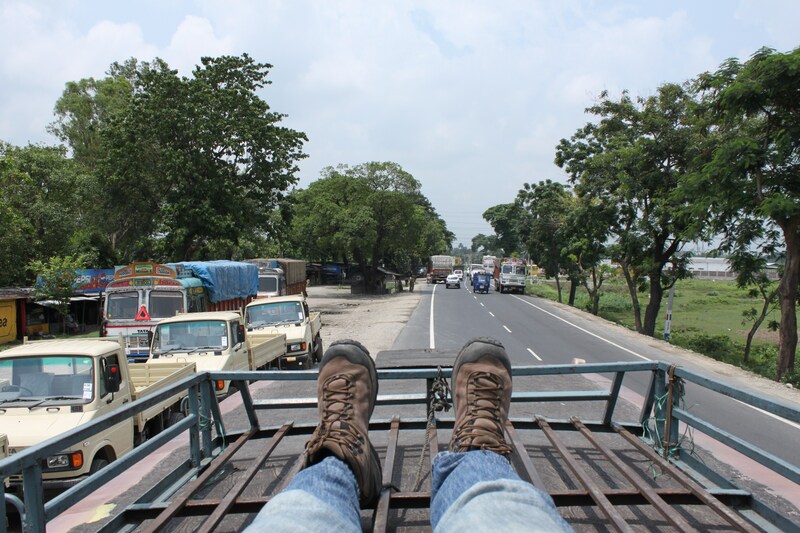 We had some fun troubling a few rickshaw drivers before we found ourselves riding on the roof of a bus on its way to Bagdogra (see pic). The journey on top of the bus was like signing off in style. We reached the intersection before the airport from where we took cycle rickshaws till the terminal. Last thoughts, at the airport, I told Keyur that I will not board the aircraft until they announce our names! And they did :). I thought the journey was over when we reached Delhi, where we split. I spent a day meeting some friends and cousins and was back to the airport the next day for my flight to Pune. Well, though I reached well in time, I was put on hold because the flight was overbooked. The remaining was a sad story of desperation, as they wanted to put me on tomorrow morning’s flight but I had to join my new organization tomorrow morning! After a lot of trouble and 7 hours at the terminal, they managed to accommodate me on an alternate flight to Pune. I reached home past midnight, with barely a few hours to go before I headed to my me organization. The journey from Bhutan was over, but a new journey began at my new employer! Hope you enjoyed reading the travelogue as much as I liked sharing it. I am attaching a list of all the hotels I stayed at along with their contact numbers to help you plan your trips. My next major plan is attempt to summit Stok Kangri (21000 ft) in August this year. Till then, cheers, and do subscribe to my site for the latest updates. Jai Hind. Your style of writing is racy , I liked it alot because it was too lively, I never realised that I had been reading it for so long . Thumbs UP ! Super like! Thanks Nitu, as always…glad you liked it! Wat an experience….truly amazing & hats off to your courage…..Im going for a Hldy on d 30th for 15 days, n ur Travelogue is like a blessing ….. Thank you…feel free to reach out to me in case you need anything. Subscribe to the website so that you receive updates about future travelogues. Aviram, Can you share the link of your Kashmir travelogue… I am planning to visit in mid November. words can’t express my enjoyment. what a way to spend your time. keep updating coz I wanna follow this and try doing the same. Thanks for your encouraging words. Good luck with your trip to Bhutan. Aaviram ..thanks writing so lively details…will you please help me that Do they need the presence of all the three in person at their office, or I can apply and sign the application form on behalf of myself and other two at Phuntsholing ? Thanks for your message. No special permit was needed to enter Thimphu Dzong. I am not sure if one person can do it on behalf of others…it might be worth a try. Ensure you carry all required documents and also a signed letter from the absentees requesting the authorities to accept their applications from you.